What happens when a unique visual style and powerful substance come together in one coffee table sized volume? Award-winning photographer Wayne Moran shows you the answer to that question in his inspiring first publication Eye of the Beholder (120 pages, $32.99 - $49.95), a collection of inspiring photographs from his newly updated portfolio of landscapes, cityscapes, architecture, nature and people. Dave Parker, acclaimed artist and photographer, says, "Wayne Moran’s artistic eye is a gift to his audience and his colleagues alike. As a fellow photographer, I have had the pleasure of working with him as he seeks the right conditions for breathtaking photographs. His work tells the rest of the story: an arresting collection of some of the finest images I have seen." “Beauty is in the eye of the beholder.” For photographer, Wayne Moran, beauty appears in many forms through the artistic lens of his camera. Moran spent more than three years capturing key locations in the Minneapolis and Saint Paul area, the Midwest and the desert southwest to produce this exquisite collection of 110 color and black & white photographs. 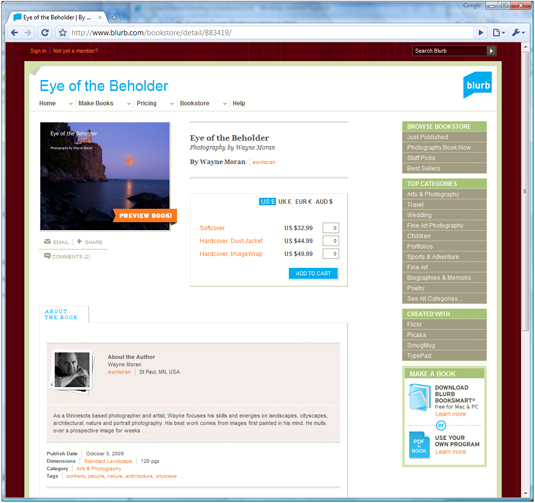 A bold and creative assortment of images, Eye of the Beholder, will transport you to places you would rather be. You will be held captive by the raw splendor of landscape, the intensity of the city, the art of architecture, the magnificence of nature and the unique character of people. Make this inspirational book a treasured addition to your library or a new companion for your coffee table! Karen Hunnicutt-Meyer, Photographer/artist, compares the works of Wayne Moran to a quote by Kahlil Gibran who said, “We live only to discover beauty. All else is a form of waiting” Wayne’s book will take you on a journey to help you discover the beauty of Minnesota and surrounding areas. It is filled with sensational photography that includes her favorite “jaw-dropping” night images of Minneapolis. You can reach Karen through her website at www.karenhunnicuttphotography.com. Deirdre Butler Derby says, "Wayne Moran has captured some of the most revered places in our time and history. Through his photography, we are able to gain a true sense of place and element defined by masterfully crafted images that hold us breath abated. Minnesota has never looked more beautiful." Find Deirdre's work at her website http://costellos.etsy.com. You can order the book immediately from the publisher by Going Here. Be sure to Look Here for Discounts and coupon codes to use at blurb.com. Or order a signed copy! You can order a copy signed by the Artist from this page. Just select the Book Style and press the "Add to Cart" button and continue to purchase from the Paypal.com website. The online order will be processed securely by Paypal.com.